No failures of the imagination here. From sneakers made from recycled ocean plastic to salvaged "Sheltersuits" that convert from weather-resistant jackets into sleeping bags for the homeless, here are seven closed-loop designs that cast the concept of "trash" in a whole new light. Above, a dramatic costume, fashioned from Senegal's polluted landscape, serves as a warning of the apocalyptic future that awaits us if humanity doesn't alter its course. 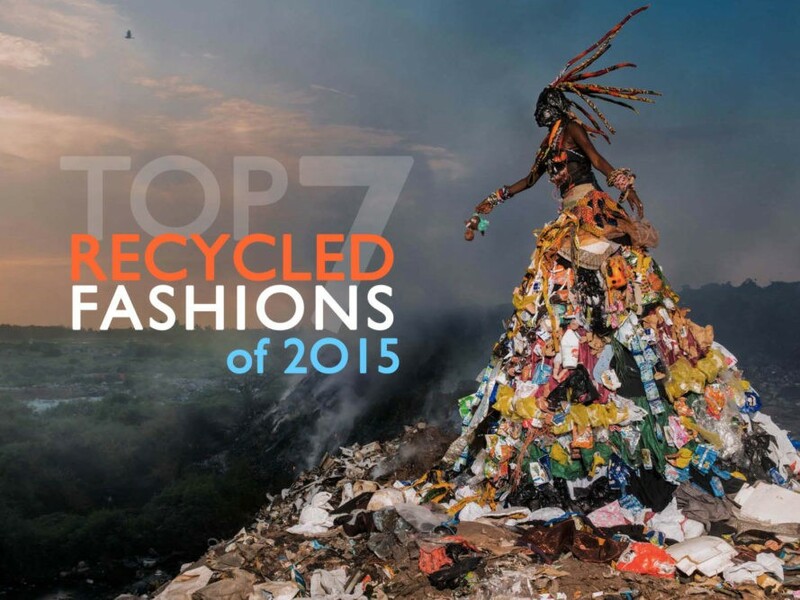 We couldn’t include all of our upcycled faves. Drop by our archives for more creative goodness. Adidas's newest sneaker is a load of garbage—ocean garbage, that is. The sportswear giant has teamed up with Parley for the Oceans, a multidisciplinary band of "creators, thinkers and leaders" who want to make ocean debris a valuable material for the fashion industry, to create the world's first shoe upper made entirely from reclaimed ocean plastic and illegal deep-sea gillnets. Repurpose's schoolbags are more than a way for students to schlep books. Designed with underprivileged South African schoolchildren in mind—and crafted from 100 percent recycled plastic shoppers—the backpacks feature a rechargeable solar panel that transforms into a "homework lantern" after sundown. Abandoned tents, a post-revel scourge at music festivals like Coachella and Glastonbury, could soon find new life as weather-resistant coats that convert into sleeping bags for the homeless; that is, if Dutch designer Bas Timmer has anything to do with it. Together with a team of volunteers, many of them Syrian refugees who receive assimilation courses, driving lessons, and help with accommodation in exchange for their efforts, Timmer and de Groot are working out of a studio in Enchede to produce and distribute as many "Sheltersuits" as they can before the mercury drops. Speedo is closing the loop, one swimsuit at a time. Together with Aquafil, the Italian manufacturer behind the Econyl line of regenerated (not to mention “endlessly recyclable”) nylon fiber, the world’s leading swimwear brand has launched a first-of-its-kind fabric-recycling program to turn its post-production waste into new swimsuits. H&M is expanding its selection of denim made from the reclaimed fibers of clothing collected through its garment-recycling initiative. The new pieces, which feature a blend of recycled and organic cotton, include three styles of jeans, a denim jacket, and a denim jumpsuit for women, two distressed slim-leg styles and a pair of coated-denim joggers for men, and a zip-up hoodie with animal ears for children. In a bid to get Europeans off their couches and actively moving, water company Vittel created a "Couch Converter" that turned swatches of sofa fabric into bespoke running shoes. Too bad it was only a limited-time offer—we can see this campaign having real legs (so to speak).